Do you know what a genre is? Teaching students about literary genres is one of my favorite things to do. I think it’s partly because it’s like planning for a serious camping trip. You need to think about, organize, and lay out all the things you need. When students are ready to get serious about reading — and by serious I mean seriously read novels independently … for fun — understanding the beautiful spectrum of genres that make up our body of literature is like laying out out a huge map for the journey. When we read, I always ask students in all elementary grades what fiction means. Inevitably they say it means “fake,” which is the pin many teachers have chosen to stick in fiction. I get why we say that, because of the alliteration. But the problem is that so much of the fiction students first read is not very “fake,” but instead very real. A better definition is to let them know fiction simply means a story that came from the author’s imagination. Then we live inside and discuss every aspect of fiction, including unfolding all the new and uncharted genres we will explore in our books. 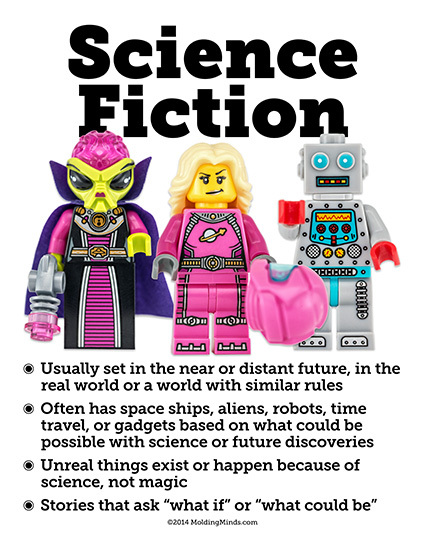 When students know fiction includes science fiction and spooky fiction and historical fiction and realistic fiction and on and on, it’s sort of hard to confuse it with informational nonfiction. I’m not sure why I began this series with science fiction, but it might be a bit of personal bias, as a lifelong nerd. Also, there are tons of seriously cool minifigures that fit the bill. My students LOVE this Youtube clip. I teach K-5 library skills and use this video with Grades 2-5. Would you PLEASE consider covering other genres like historical fiction, realistic fiction, fantasy, mystery…Many thanks for this terrific teaching tool. PLEASE add to this collection—this is fantastic! 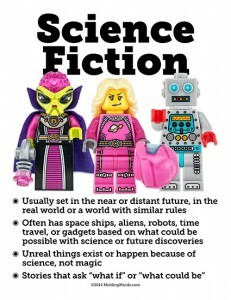 I teach K-5 Library, and this is a fabulous way to introduce Sci Fi…..please add to your genre collection! Historical fiction, myth and other traditional stories, fantasy, mystery, realistic fiction biography, poetry….What a great resource! I agree 100% with these comments. I teach K-5 Library Media, and this video is perfect. Not too long that they get bored, plenty of visual interest, and LEGOs are perfect attention grabbers! I am so pleased to hear you will be expanding to other genres! Another school librarian chiming in here…love this video and can’t wait for more! It’s perfect for my K-5 students. Yes. We need more of these videos. How about Traditional Literature (folktales, fairytales, talltales, myths, legends) Historical Fiction, etc. My students love the two you have completed. They love you mixed in Legos and you have a pretty good voice to do these. Thanks for the two you have completed. Can you please make more videos for the other types of genres and posters? They are amazing. My students LOVE them.